When the seasons change, so do our tastes. What seemed right a few weeks ago (sliced watermelon, shrimp on the grill, heirloom tomato caprese salad) just doesn't cut it now that it's October and almost Halloween. Wholesome comfort food is what we need now: hearty and rustic, good enough for guests but great leftover too. Here's a recipe that fills the bill, using seasonal bounty - the last of the summer zucchini, the first of the autumn aubergine (a.k.a., eggplant), plus just enough cheese (Parmesan) and cream (half-and-half, actually) to give it that satisfying richness. A good baguette for the homemade breadcrumbs gives the topping a highly satisfying crunch. This recipe if from Cooking Light, so you know it's good, and relatively good for you. 3. 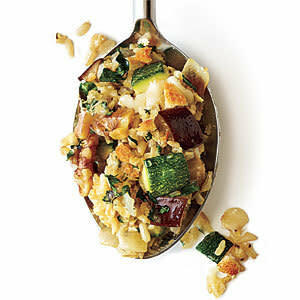 Combine eggplant, zucchini, 1/4 teaspoon salt, and 1 tablespoon olive oil in a bowl; toss to combine. Place eggplant mixture evenly on a large baking sheet coated with cooking spray. Bake at 400° for 15 minutes. Place vegetables in a large bowl. 4. Reduce oven temperature to 375°. 5. Heat a large nonstick skillet over medium heat. Add 2 teaspoons olive oil to pan, and swirl to coat. Add onion and garlic; cook for 12 minutes or until tender. Add onion mixture to eggplant mixture. Add cooked rice, remaining 1/2 teaspoon salt, 3/4 cup cheese, and the next 3 ingredients (through eggs), and stir well to combine. Spoon rice mixture into an 11 x 7–inch glass or ceramic baking dish coated with cooking spray. Cover with foil, and bake at 375° for 15 minutes. 6. Place bread in a food processor; pulse 10 times or until coarse crumbs measure 1 cup. Heat a large skillet over medium-high heat. Add the remaining 1 teaspoon oil to pan, and swirl to coat. Add breadcrumbs, and cook for 3 minutes or until toasted, stirring frequently. Remove pan from heat; stir in remaining 1/4 cup cheese, walnuts, and parsley. 7. Remove foil from rice mixture. Top evenly with breadcrumb mixture. Bake, uncovered, at 375° for 15 minutes or until vegetables are tender and topping is browned.